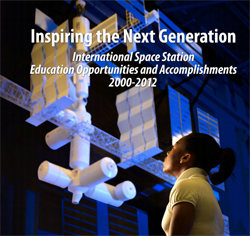 Hathaway Brown’s PEACE Team has been featured in a new book called Inspiring the Next Generation: International Space Station Education Opportunities and Accomplishments 2000-2012. You may access the file digitally by clicking here. HB is featured on pages 83 and 84. This publication was produced jointly by the Canadian Space Agency, the European Space Agency , the Japan Aerospace Exploration Agency , the Russian Federal Space Agency, and the National Aeronautics and Space Administration. Over the years, these programs have offered numerous many opportunities for hundreds of schoolchildren to get involved in initiative involving the International Space Station. PEACE (Polymer Erosion And Contamination Experiment) is a multi-year experiment that is being conducted as a collaborative effort between Hathaway Brown School and NASA Glenn Research Center. It was initiated in 1998 when HB received from the American Chemical Society a reservation to fly an experiment on the space shuttle. Upon obtaining the space experiment reservation, the school approached NASA Glenn and found engineers in the Electrophysics Branch who were willing to partner with and mentor our students as they conducted a space experiment. Project PEACE has been ongoing for 14 years. Under the leadership of HB's Director of Research Patricia K. Hunt,a team of HB students and teachers, along with NASA engineers Kim deGroh and Bruce Banks have been working together toward the goal of better understanding and beginning to solve the serious problem of Low Earth Orbit erosion problems due to the problematic predominant atmospheric species at LEO, atomic oxygen.